The NASC is set to launch its 2016 Safety Report at the forthcoming ‘The Health & Safety Event’ industry event being held at the NEC, March 22-24. The highly-regarded annual NASC Safety Report documents and analyses accident and injury statistics for all 199 NASC full contracting member companies in 2015 – covering 14,954 scaffolding operatives, which constitutes a major proportion of the UK’s total scaffolding workforce. 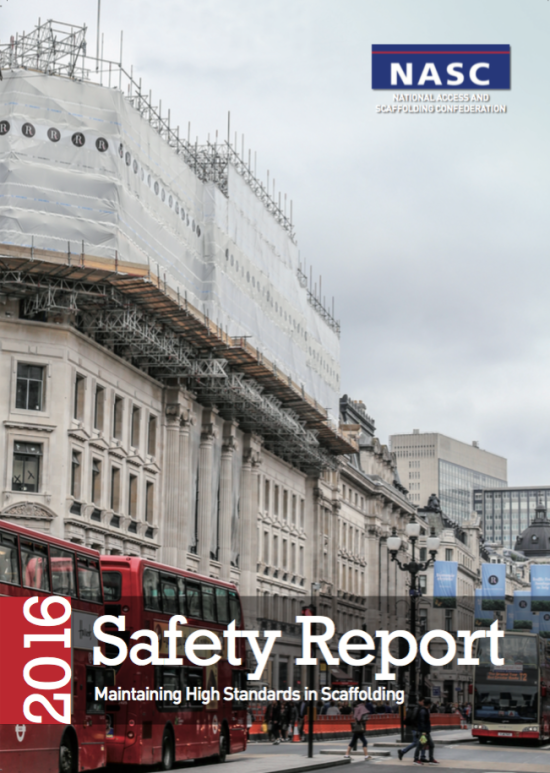 In addition to its launch on the NASC stand (C66) at The Health & Safety Event on March 22nd, the NASC 2016 Safety Report is also being circulated with Construction News in their April Work at Height issue, publishing April 29th. And a digital PDF version will be available to view online here and hard copies of the report will be sent to all NASC Full Contracting member companies, Hire, Sales and Manufacturing members and Information members, as well as construction and health and safety industry professionals. Injuries and fatalities to operatives, members of the public and third parties. Comparison of HSE/NASC accident statistics. What the NASC does to support safe scaffolding practice. Positively, figures included in the 2016 NASC Safety Report show another zero for fatal accidents within the membership, there were no reported falls from a scaffold/working platform where the fall was arrested by a lanyard/harness, and falls from scaffolds/working platforms showed a decrease of 44% in 2015 from 9 to 5 incidents, in addition falls from ladders also decreased. The report also states, as per previous years, that the highest number of accidents occurred in the 21- 30 age group = 42 (44%) and it was scaffolders reporting the greatest number of incidents (also at 44%) compared to other scaffold sector jobs, like labourers and managers. NASC President, Alan Lilley said: “The NASC continues to produce this most detailed and honest breakdown of the incidents that occur annually within the membership of the confederation. Safety professionals across the construction industry rush to analyse the detail, as do we: the information it contains is used to benchmark our members against the wider industry and to ensure that our safety and technical guidance remains good practice and fit for purpose within the scaffolding and access sectors. “The NASC members’ incident statistics over the years have seen dramatic reductions in major injury and fatalities – and this year sees many positive safety statistics again. NASC Managing Director, Robin James added: “It’s pleasing to see that our members and their 15,000 scaffolding operatives – accounting for a significant share of the UK scaffolding workforce – have once again helped reduce accident and injury statistics across the sector. To obtain a digital PDF copy of the NASC 2016 Safety Report please visit the new website Safety Report section here (https://www.nasc.org.uk/information/safety-reports/) or contact NASC directly for a hard copy. And to obtain details about becoming an NASC member and to find out more about the NASC, the national trade body for access and scaffolding in the UK, visit www.nasc.org.uk or email: enquiries@nasc.org.uk.